Thanks very much Tom for your response. This issue is resolved after replacing the graphic card driver installed by default with that provided from the website of the card developer. However, I am having two other issues now. One, in the terminal, I am occasionally getting capital U's and L's when running GNU Radio with one Tx and 4 Rx channels. Please note that I am using timed-commands to start both the Tx and Rx's at the same time. When I check the system monitor while GNU Radio is running (please see the attachment), the CPU history and RAM usage seem to be fine. What causes this issue and how to handle it? Could it be due to some instability in the writing speed to the hard drive? BTW, I am having the same issue for my older PC (a PC with less specs). 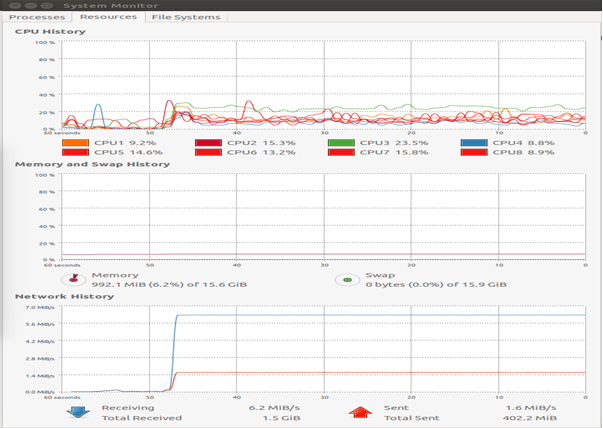 The System Monitor tells me that my CPU usage is around 60% and my RAM usage is around 25 %, however, I am getting U's and L's when I try to use four Rx channels. Please note that the system doesn't throw lots of U's and L's at once, it is a kind of frequent where bunch of them are thrown out every few seconds or so. Things work fine if I replace the virtual blocks with direct connections. I am not sure why?